Let guests select the heat level of these Southern-style croquettes by adding the piquant sauce to taste. For chipotle mayonnaise, stir together mayonnaise or salad dressing, chipotle chile peppers, and garlic. Cover and refrigerate up to 1 week until needed. In a saucepan cook corn, green onions, mustard, coriander, and red pepper in butter or margarine about 5 minutes until corn is tender. Place in a mixing bowl, and add eggs, the 1-1/3 cups bread crumbs, and crabmeat. 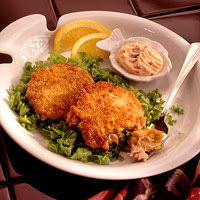 Shape into eight 1/2-inch-thick patties using about 1/3 cup crab mixture for each. In a shallow dish stir together the 1/3 cup bread crumbs and cornmeal. Coat patties with cornmeal mixture. In a large skillet heat oil over medium heat. Add half of the patties. Cook for 2 to 3 minutes per side or until golden brown. Drain on paper towels. Keep warm in a 300 degree F oven while frying the remaining patties. Serve warm with Chipotle Mayonnaise and, if desired, lemon wedges. Makes 8 servings (2 cakes with 2 tablespoons mayonnaise per serving). Calories 614, Total Fat 46 g, Saturated Fat 8 g, Cholesterol 245 mg, Sodium 750 mg, Carbohydrate 27 g, Fiber 2 g, Protein 26 g. Daily Values: Vitamin A 17%, Vitamin C 12%, Calcium 11%, Iron 17%. This entry was posted on 3:19 PM and is filed under Fish and Seafood . You can follow any responses to this entry through the RSS 2.0 feed. You can leave a response, or trackback from your own site.